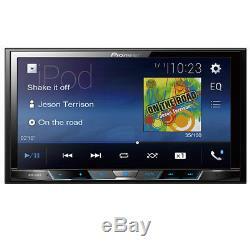 In-Dash Double Din MP3/WMA Digital Media Receiver With 7 Touchscreen LCD, Built-in Bluetooth, iPod/iPhone Control Please NOTE: This Radio Does NOT Play DVD's or CD's. Brand New, In Factory Box, Not Re furbished. Hands-Free Calling and Audio Streaming Stay safe and obey local hands-free laws with built-in Bluetooth (HFP). When a registered Bluetooth device is in close proximity to the receiver, the auto connection function automatically pairs the two units. From hands-free calling, wireless audio streaming (A2DP) with artist, album, and song search, simple pairing, and control audio (AVRCP), Bluetooth® wireless technology has made life in the vehicle much more convenient. The MVH-300EX with Bluetooth also includes better call quality reception using the new Wideband Speech Handsfree Profile 1.6. Wideband Speech nearly doubles the bandwidth of frequencies of a normal bluetooth call. Other features include the ability to browse music libraries on smartphones wirelessly. Android Music Support Users of Android devices running operating system 4.0 or later can connect and listen to music stored on their device to the MVH-300EX without the need for an app. The process is made possible using Media Transfer Protocol (MTP). MTP allows the receiver to recognize the Android smartphone as a music storage device. Users can now access music via USB stored on an Android device and operate basic operations like FF, REW, Play, Pause, Random Play, and Repeat. Metadata information such as track, artist, and album name can be displayed. Song, artist, time and album information are beautifully displayed on the 7 touchscreen. The system's wired USB connection provides direct digital signal transfer from the device for clean, clear sound while providing 1.5 amp of current to keep your iPod/iPhone charged. Back-up Camera Ready Back-up camera input enables you to add a reverse (rear facing) camera that can assist with rear visibility, towing, or parking. Customize Your Colors Select among five colors (blue/red/amber/green/violet) for the display and 112 different colors to match unit illumination to your vehicle's interior lighting. Also choose from several background images to suit your mood. Screen Size/Aspect Ratio: 7, 16:9. Resolution: WVGA (800 x 480). Hands-Free Profile (HFP): HFP 1.6. Audio/Video Remote Control Profile (AVRCP): AVRCP 1.6. Advanced Audio Distribution Profile (A2DP). JPEG Photo Slideshow Viewer: USB. Built-in Amplifier: MOSFET 50 W x 4. Easy EQ (EEQ) Preset Equalizer. Time Alignment (CD-MC20 required): Manual. 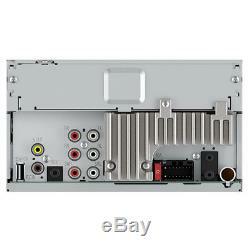 USB: Single, Rear (1.5 Amp). USB Direct Control for iPod®/iPhone®. Virgin Islands and other countries outside the USA. 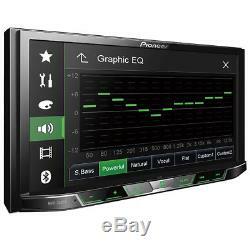 The item "Pioneer MVH-300EX Double 2 DIN MP3/WMA Digital Media Player 7 LCD Bluetooth" is in sale since Friday, March 2, 2018.